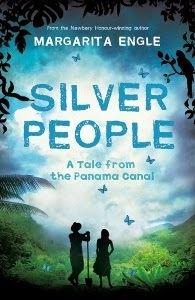 Silver People is Young Adult historical fiction written by Margarita Engle, published by UQP (2014) and is 215 pages. An outstanding and well-crafted verse novel for the 12+ age group, Silver People is about the building of the Panama Canal one hundred years ago. The story is told in alternating multiple voices. It begins in 1906, when an American recruiter promising lots of money contracts poverty-stricken workers mostly from the Caribbean Islands. He offers the opportunity of a lifetime. This second attempt at the canal by the Americans in 1904 took ten years to complete. The first had been by the French in 1881. This was abandoned due to the high mortality rate from sickness, and severe engineering problems. Margarita Engles’ writing is lyrical and expressive. She draws dramatic, detailed pictures and scenes with minimal words. The voices of her characters - which include trees, animals and other life of the forest – talk of the brutality against the non-American labourers, the harsh conditions and desperate hunger they endured, and of the unspeakable injustices perpetrated against them due to their origins. The voices also tell of the ravaging of nature, and the massive loss of life both human and animal. This book is more about the people who built the Canal, rather than the Wonder itself. Rarely acknowledged, these semi-dark and dark skinned people sacrificed themselves for payment of twenty-five cents a day. That’s how they got the name Silver People. Forced to eat standing up after backbreaking work ‘digging with nothing but shovels and courage’, they slept without shelter, beds or blankets. Even a change of clothing was denied them. Punishment for escaping was arrest and chains. All this while the American workers were paid in gold, lived in comfortable and air-conditioned accommodation , and had nourishing and plentiful food and drink. This is a superbly researched piece of history recalled; a reflection on how great feats were accomplished, and at what cost. It presents a wonderful picture of life during that time with a strong environmental theme filtering through. Historically relevant and highly educational, it’s a superb read for all ages.